The same day I made that post, they started changing up the way they did the sheets again. I suspect that the different way of doing up the bed depends on which cleaner gets to my container first... or if it's the same cleaner, how experimental she feels at any given day. A variation on an earlier theme, with a less sharp angle and less of the gray blanket showing. Almost daring, considering all the cleaner had attempted before was 90º and 45º folds. A throwback to the safe and familiar style, but with gray stripe that is wider. For some reason this strikes me as being almost strict - cold and efficient, yet also easy to slip into at night. Again back to a familiar style, but with a narrow gray line again. This one caught me by surprise, since my pillows were on top of each other for once. It took me a little while to spot the other subtle differences on this one. 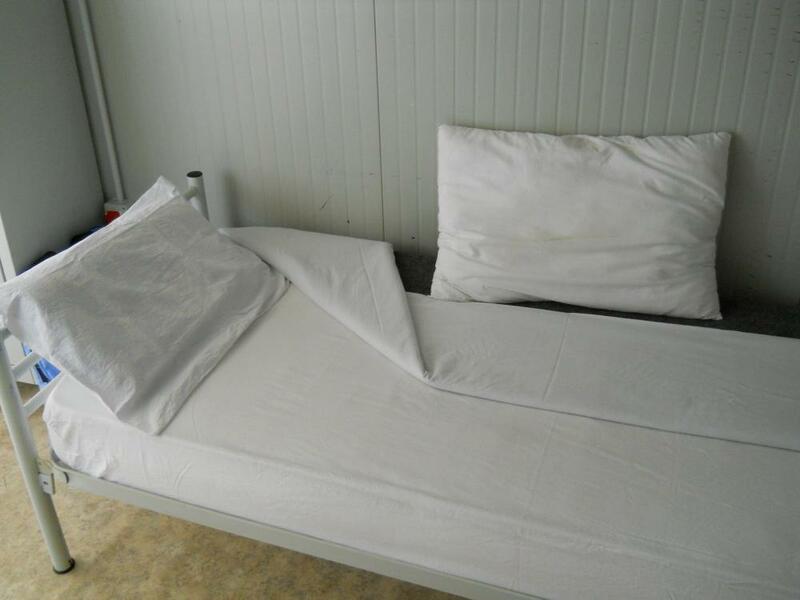 This is when I formulated my theory of two cleaners - note how the wide fold of the white sheet corrals the extra pillow into a small, strictly defined space. Here the cleaner took the idea behind the pillow corral and experimented a bit further - creating a bed that was oddly symmetrical and unsymmetrical at the same time. We have to find entertainment where we can, being so far from friends and family (not that I ain't making new friends, far from it).